The Stralis X-WAY raises the stakes in light off-road missions with the biggest payload in its segment. 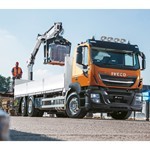 It combines the best of IVECO’s fuel-efficiency and safety technologies with the legendary off-road robustness of its toughest vehicles to deliver high productivity with low Total Cost of Operation. The Stralis X-WAY takes the modular approach to the extreme offering ultimate flexibility, starting from a choice of line-ups which can be tailored to a specific mission with an extensive offering of features components and specifications. The Stralis X-WAY integrates IVECO’s best, most advanced features for on-road missions: from the best-in-class transmission and the new HI-MUX electrical and electronic architecture, to features designed to enhance fuel economy and sustainability. State-of-the-art systems such as HI-CRUISE integrates driving assistance functions such as eco-roll, predictive gear shifting and predictive cruise control; the Smart Auxiliaries that minimise fuel usage in every situation. Smart EGR improves combustion with optimised injection timing, further increasing peak cylinder pressure and fuel efficiency. 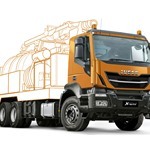 The proven fuel reduction technologies featured in the Stralis X-WAY have been shown to reduce fuel consumption by 11.2% in the Stralis XP, as validated by TÜV SÜD one of the world’s leading technical service organisations. 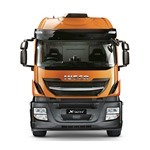 The Stralis X-WAY also offers the ultimate comfort of the AS cabin, which has been designed around the driver for the long-haul missions of the Stralis XP. 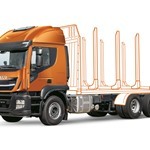 The Stralis X-WAY is built to carry big payloads. 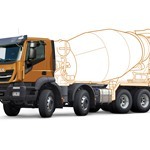 The low kerb weight – as little as 9 tonnes on an 8×4 chassis in the Super Loader concrete mixer version – together with this strength, means that it has the best payload capacity in the market in its category. 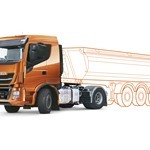 The Stralis X-WAY tackles with ease the off-road sections of its missions with the new HI-TRACTION system, which provides additional hydraulic front-wheel traction when needed, improving the vehicle’s stability and the driver’s safety on difficult terrains.